Brooms, Paint brushes and Floormatting | Repair Management Nederland B.V.
A various line with brushes for painting jobs and floor brushes is available. Many of those products are on stock in our warehouse. 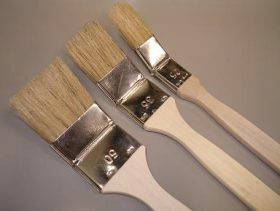 For each painting job we can supply paint brushes, paint rollers, paint buckets, emmery papers, putty knives, masking tapes, etc. 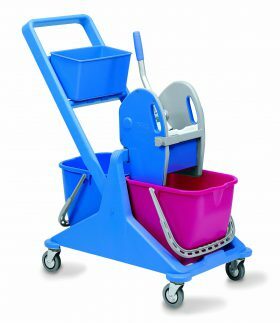 For cleaning we are dealer for Nedac Sorbo Vero products. This manufacturer offers a superb quality of brooms, brushes, squeegees, sponges, mops etc. Many of those product are direct from our warehouse available. Also matting in all types are possible. Vero has been a part of Nedac Sorbo since 2004. Vero is well known by their high quality of there brushes, brooms, Mops and other cleaning tools. NoTrax is an well known manufacturer of all special floor mattings from the USA. Founded in 1948 has this company committed itself to customer service, quality products and sales support. 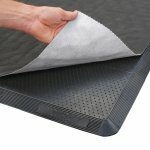 There a three ranges of mattings, the NoTrax Dust Control Mats with a range of indoor and outdoor mattings , the NoTrax Ergonomic Anti-Fatique and Safety Matting with a range of top quality mattings for heavy dute industrial use and the NoTrax Floormatting line for Food Processing and Foodservice. 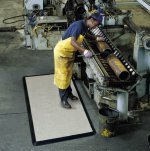 NoTrax develloped a special Anti-fatique matting for combined use with a sorbent. Made of high quality nitrile rubber compound designed to withstand industrial oils. Ramps on four sides are raised to form a holder tray around the mat. Rough “gripper”surface prevent the sorbent from shifting. Non-Shifting, Free of silicone therefore safe for vehicle painting facilities. Ergonomic benefit derived from 12.7 to 19 mm thick worker platform. Available as type 580 Sorb Stance Heavy Duty and 585 Eco Stance Medium Duty. 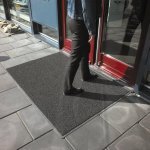 The Wayfarer is a non-absorbent product available in standard size mats for lose lay, with pressed bevelled borders on all four sides. Vinyl loops scrape dirt and moisture of shoes, allowing it to fall in to the mat and not be tracked in to the building. Durable flexible material is ultra violet resistant, performs well in different climates and adapts to any surface. Does not absorb water. Choice of backed or unbacked construction. Backed version ensures minimum movement while unbacked version allows water to flow through. Slip resistance tested R11 according to DIN51130 and BRG181. 16 mm backed, weight 6 kg per m², overall thickness 16 mm, thick coils (strand diameter 1 mm) of extruded from 100% PVC, backing vinyl, fire retardancy ASTM D2859 passes DOC FF 1-70, DIN EN 13501 Bfl-S1. Available in colours Charcoal, Red and Navy Blue. Stock sizes are 90 cm x 150 cm and 120 cm x 180 cm. Suitable for heavy traffic conditions, for placement interior or exterior facility entrances. 14 mm unbacked, weight 4.8 kg per m², overall thickness 14 mm, thick coils (strand diameter 1 mm) of extruded from 100% PVC, fire retardancy ASTM D2859 passes DOC FF 1-70, DIN EN 13501 Bfl-S1. Available in colours Charcoal, Red and Navy Blue. Stock sizes are 90 cm x 150 cm and 120 cm x 180 cm. Suitable for heavy traffic conditions, for placement interior or exterior facility entrances. 10 mm backed, weight 3 kg per m², overall thickness 10 mm, fine coils (strand diameter 0.35 mm) of extruded from 100% PVC, backing vinyl, fire retardancy ASTM D2859 passes DOC FF 1-70, DIN EN 13501 Bfl-S1. Available in colour Charcoal. Stock sizes are 90 cm x 150 cm and 120 cm x 180 cm. Suitable for light to medium traffic conditions, for placement interior facility entrances or recessed wells. For electrical safety, corrugated rubber matting, on roll, thickness 3mm width 1000mm, roll length 10 meter. 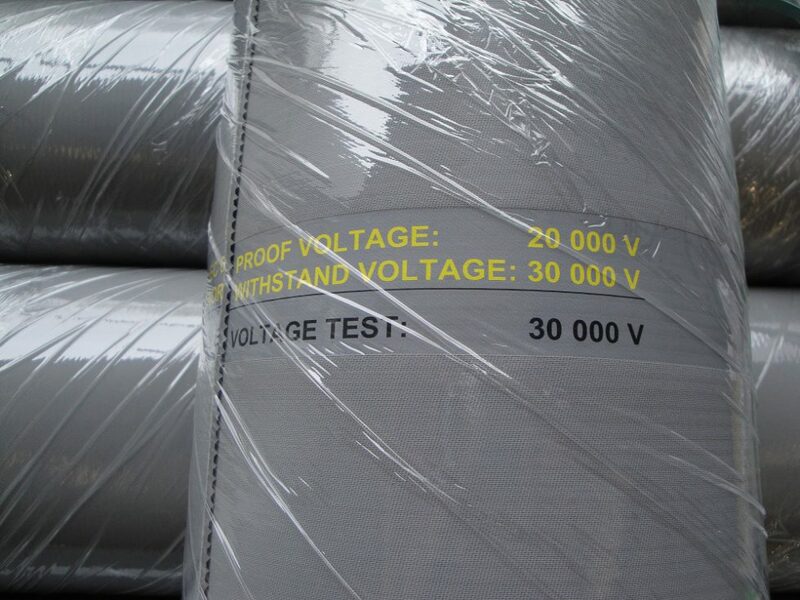 With approval IEC 61111:2009 Class2, Color Grey, Standard: DIN-EN 60243-1 VDE 0303-21, Voltage proof 20.000 Volt and withstand voltage 30.000 Volt. Paint Brushes, Paint Rollers and other materials. 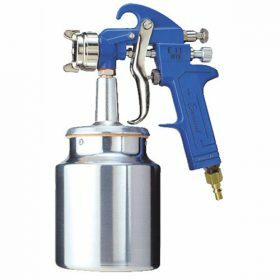 Repair Management can offer a complete range of tools for painting jobs. Not only brushes and rollers but also spray equipment, masking tapes and personel health and safety products for the applicator.